We Make Exercise Fun for the Whole Family! Do you want to have energy to keep up with your kids? Help your entire family learn powerful life skills they need to live a meaningful life? Then come to UpLevel Martial Arts to have a blast! We all want more energy and to look great. Of course, we also know that it’s easier said than done. We’ve heard it before. “Your body needs 30 minutes of exercise, 3-4 times per week.” But we let crazy schedules, unexpected work emergencies and kids’ needs cause us to let it slip by. We do house maintenance, help kids with homework and feel chained to our desks during the workday. We crave pizza, pop, hot dogs, French fries and hamburgers instead of what our bodies need to thrive. We make New Year’s resolutions to shed pounds. So we head to the gym, logging endless miles on the treadmill. We work out parts of our body, but it doesn’t resolve the core problem. Imagine what would happen if you turned working out into a fun family activity. You’d get fit along with your kids. Plus, it creates great family memories. Many families tell us they never knew working out could be so much fun! At UpLevel, no two workouts are the same. Your physical limits will be tested (in a good way). It also helps your entire body get stronger, as you’re working out all important muscle groups. We also rock out some inspiring workout music, so you feel ready to rock this! Don’t let crazy schedules cause you to neglect your own health. It's not easy, but so incredibly rewarding. Plus, many families make the time for it… because it’s so much fun! 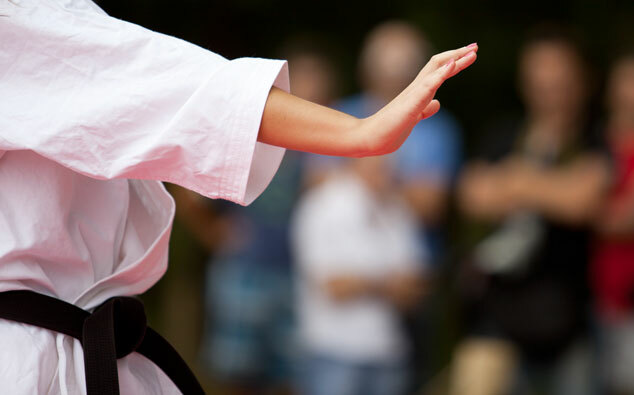 Ready to experience the martial arts workout that families find addicting? Come join us for a free trial martial arts class! At UpLevel we believe commitment is the key ingredient for successful life so after your trial class we will invite you to enroll in our Basic Program and make a commitment to your orange or green belt. After you experience the benefits and if we decide together that you are ready we will ask you to make a commitment and join our black belt leadership program that trains our students to red or black belt – you choose. We have other programs that go much further to 2nd, 3rd, and even 4th degree black belts. We do understand however that life happens and so we have a very liberal cancelation policy in place should something come up where you need to cancel.